WKU alum Daniel Pulliam is the 2018 inductee into the WKU Libraries Open Access Hall of Fame, recognizing him for his thesis “Effect of Student Classroom Cell Phone Usage on Teachers” which was submitted in Spring 2017 to the university repository TopSCHOLAR®, and has been downloaded over 44,000 times from 181 countries. From Crestwood, Kentucky, Pulliam graduated with a School Psychology Ed.S. degree from WKU in Spring 2017. He currently serves as a school psychologist in the Perry Township School District in Indianapolis, Indiana. Each year during National Open Access Week in October, WKU Libraries recognizes a faculty and/or student who has enhanced the university’s research and creative database known as TopSCHOLAR® according to WKU Libraries Scholarly Communication Specialist Todd Seguin. “We are pleased to honor Mr. Pulliam and his work which has drawn thousands of researchers from around the world to our open access platform. Since his thesis was uploaded April 10, 2017, there have been more than 44,000 downloads--a very significant number,” said Seguin. To read Pulliam’s thesis, go to https://digitalcommons.wku.edu/theses/1915/ or for more information about TopSCHOLAR® go to http://digitalcommons.wku.edu/ or contact Todd Seguin, Scholarly Communication Specialist, at 270-745-6160. 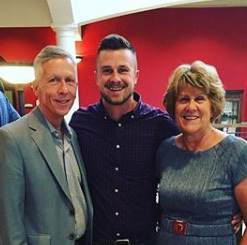 Photo note: Daniel (middle of photo) is pictured with his parents at his WKU graduation.